Psychiatry and Mental Health Research publishes Psychiatry and Mental Health Research journal aims to publish contemporary research findings pertaining to experimental, preclinical and clinical analyses of diversified aspects of mental health management; etiology, pathology, diagnosis and treatment of psychiatric medical conditions. The journal also covers research studies that directly or indirectly address hitherto unexplored topics related to addiction psychiatry, alcohol addiction treatment, adult sexual behavior, anger management, child mental health, anxiety, dementia and depression. The journal provides a global platform for the exchange of knowledge and information relating to any/all aspects of psychotherapy and neuropsychiatry. This OPEN ACCESS peer review journal publishes original articles, reviews and medical society statements that highlight clinical and subclinical aspects of treatment and management of acute and chronic mental conditions, such as Alzheimer’s disease, autism, bipolar disorder, neurodegenerative disorders, schizophrenia, suicidal behavior and post-traumatic stress. The journal also promotes the conceptualization and implementation of more effective health programs and mental health services that are specifically aimed to mitigate the morbidity caused by mental disorders and the social stigma associated with it. The Journal is available both electronically and in print. 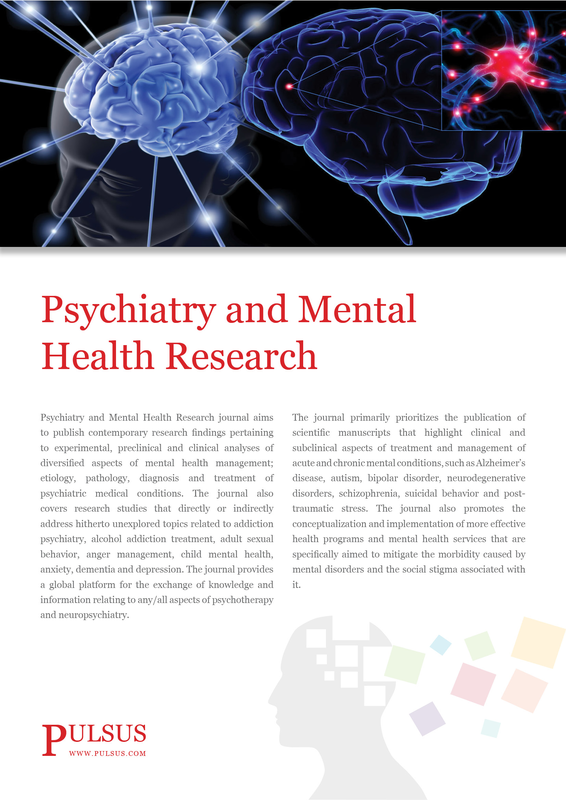 The digital version is sent to more than 6,000 qualified psychiatry and Mental Health researchers around the world. Each lead author of a published article receives a paper copy of the Journal in which his/her article was published (additional copies available for nominal fee).